Restorative dentistry involves a number of important procedures that are necessary for patients who are experiencing severe pain or have lost much of the functionality of their mouths. While these procedures often have cosmetic benefits, in this instance it is all about restoring your mouth to a healthier condition. Whether through decay, trauma, or disease, there are many issues that could start interfering with the proper and necessary functionality of your mouth. Restorative dentistry comes into play when it’s time to rebuild a significant portion of your upper or lower teeth. What Procedures does Restorative Dentistry Include? It may take a number of different procedures to fully rebuild your teeth, restore your gum line, and fix problematic jaw mechanics. Our goal is to quickly alleviate any pain you may be feeling and then correct any issues that are interfering with the functionality and appearance of your mouth. Replacing any missing teeth. This is most commonly accomplished with dental implants. Repairing any cracks, chips, or gaps in the teeth. The simplest way to do this is with inlays or onlays. Restoring broken or misshapen teeth with crowns and bridges. Gum disease treatment if necessary, and gum contouring to make sure the gums remain healthy. Fillings and root canals to remove the decay or infections that may be causing problems. Straightening teeth to restore a comfortable bite and minimize areas where bacteria can cause more cavities. All-on-4 dentures if you are missing a significant number of teeth. Cosmetic procedures like teeth whitening, just to be sure the final results include a great smile. Many people may need one restorative procedure or another. A few will need a full mouth reconstruction. 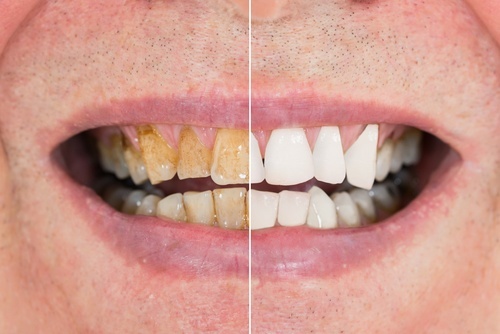 How do you know if you need some major restorative work? It’s important to understand that while most restorative procedures can be completed in a single visit, there are some that will require some extra work. Simply put, some of these procedures aren’t fast or simple. When it comes to restoring the functionality of your mouth, it is going to require a little more work than a simple cosmetic procedure. Sometimes, patients may have to visit us several times as we work to toward restoring the bite, replacing the teeth, and correcting any issues with the gums. The simple fact is that some of these procedures will take time to complete, but we’re going to do everything we can to make sure every visit is comfortable and successful and gets you closer to a fully functioning, pain-free, and aesthetically pleasing mouth.